Amid Hyundai Motor’s efforts to capitalize on its fuel cell electric vehicles, its Executive Vice Chairman Chung Eui-sun zoomed in on hydrogen energy as a key economic and social solution for clean mobility at a forum in Singapore last week, the company said Sunday. As the global automotive industry and governments search for clean mobility, Hyundai Motor has been trying to promote hydrogen cars as the ultimate eco-friendly transportation. After attending the forum, Chung flew to China, where he attended the first China International Import Expo in Shanghai and met with Shanghai Mayor Ying Yong. Hyundai took part in the exhibition to tap into the world’s biggest auto market with its Nexo FCEV and high performance N brand, the company said. “The report (released by the UN) warns us that we must decrease global greenhouse gas emissions 45 percent below 2010 levels by 2030, in order to avoid a catastrophe. 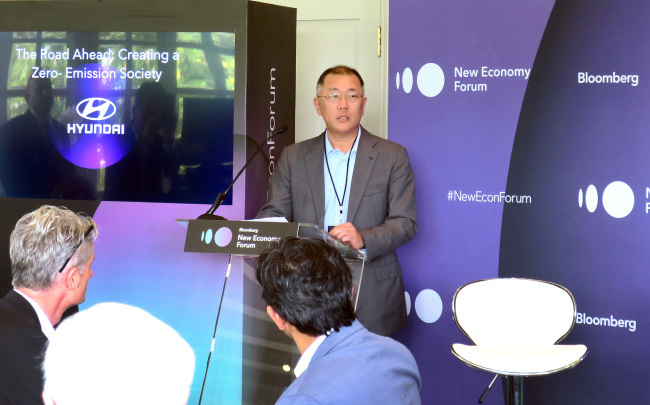 I sincerely believe without any shadow of doubt that hydrogen has a place as a central pillar to the clean energy transition,” Chung said at the opening speech of a discussion arranged by Hyundai at the Bloomberg New Economy Forum last week. The discussion dealt with creating an emissions-free society and sustainable development, led by President of the Royal Economic Society Nicholas Stern, and joined by Kim Sae-hoon, vice president of Hyundai Motor’s fuel cell group, CEO of Macquarie Group Asia Ben Way, and founder and managing partner of FutureMap Parag Khanna as panelists. During the discussion, Macquarie Group Asia CEO Ben Way urged governments to adopt consistent policies for the market to gain confidence in renewable energy, ultimately to attract participation from members of society and engineers in the transition to clean energy. According to research firm IHS, the market size of hydrogen vehicles is projected to grow to 2.2 million units by 2030 from this year’s 50,000 units. To take lead in hydrogen fuel cell technology currently championed by Hyundai, Toyota and Honda, Hyundai launched the Nexo FCEV with 600 kilometers of driving distance at the CES 2018 in late January, offered test rides for the public to experience Nexo and the vehicle’s automation at the 2018 Pyeongchang Olympics, signed the Hydrogen Energy Fund with China’s Tsinghua Industrial R&D Institute last month, and forged partnership with Audi in hydrogen technology in late June, among other moves. During President Moon Jae-in’s state visit to France last month, Hyundai Motor inked a memorandum of understanding with French industrial gas supplier Air Liquide and French electric utility company ENGIE to increase the number of hydrogen chargers there and to ship 5,000 units of FCEVs by 2025, the company said.